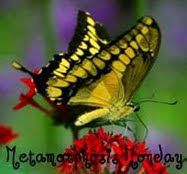 Today I'm sharing two Metamorphosis with you. The first is the book case at my parents home. When they built this home about 15 years ago, they were savvy enough to build extra wide shelves on the first shelf of each section of each book case. There is a book case on either side of their fireplace. This has provided an excellent way to display vignettes. Here is their nativity scene, which was my paternal grandparents and then handed down to my father. He thinks it is Hummel, although it is not marked. On the other side of the fireplace the book case displays their village. I should have asked Mom the brand of this village, but I'll bet some of you already know. Both of my sisters have lived in and around Chicago at some point, hence the Wrigley Field piece. For the second Met Monday, I am showing the transformation of my corner space at the booth. On top of an antique wash stand I display purple and blue ornaments. 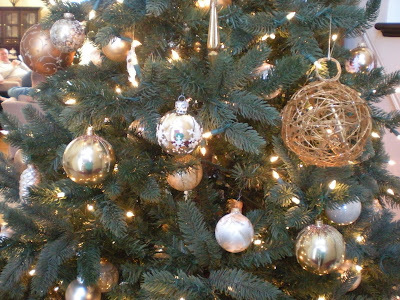 The sparkle and glitter ornaments are all the rage this year. I liked the non-traditional colors here. Also shown is a black and blue toile cake plate and two mugs. I think this would make a great gift! I hope you've enjoyed these displays today. Please join Susan over at Between Naps on the Porch for more Met Monday and have a great week! Last Saturday evening we went to my Mom and Dad's farm over in Shelby County for a birthday celebration dinner. My son, my dad, my sister and myself all celebrate birthdays from November 11th to December 16th so my parents hosted a joint celebration. 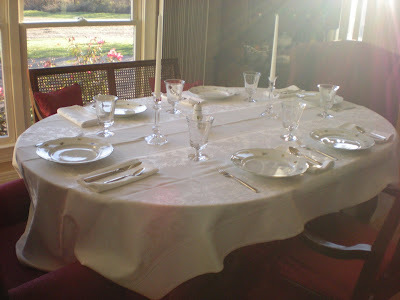 Mom set a beautiful table with white damask tablecloths. You can see what a sunny day it was by the sunlight streaming through the windows. 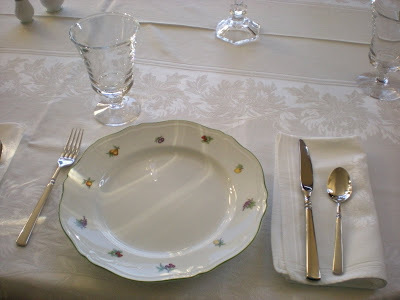 Mom and Dad ordered the tableware from a long established business in Florence during a visit there several years ago. The manufacturer is Richard Ginori. The pattern is Elea. Here is a bit of information about the manufactorer from the Richard Ginori website. "The "Factory of the white gold" Born in 1735 in the Grand Duchy of Tuscany, near Florence, the great business minds of the Marquis Carlo Andrea Ginori. When the aristocratic Florentine villa poised to shower in the family estate, what then becomes one of the most famous manufacturers of porcelain art, the white gold rush, had just infected Europe. The development is difficult but then the manufacturing takes off. If in 1747, the factory Shower 2 furnaces are in operation, one for the tile, the other for china in 1774 to about one hundred employees. In 1838 the furnaces are 5, three for the tiles and the porcelain stoves and 2 and nearly 200 employees. In 1889 the furnaces have become 15 with about 1200 employees. Enlightened guidance of the Ginori family continues until 1896 the year when the merger takes place with the ceramic industry in Milan Augustus Richard, who already owns several factories in the north. Thus was born the Richard-Ginori. Many mechanical innovations introduced in the time laboratories: while you realize the "classical" model of production docciana are born individuals who suffer from the new trends of Art Nouveau. When the architect Gio Ponti became the artistic director, his renewal program leaves an indelible mark and significant. The expansion is intense and continuous so that in 1930 the built-up area reached 80,000 sqm, with 40 furnaces and 2,000 employees. After the last world war it was decided to build a new factory more .. "next to the road" .. built with modern rational basis in Sesto Fiorentino, where in 1958 will be moved from the historic Shower establishment. A few years later the museum." 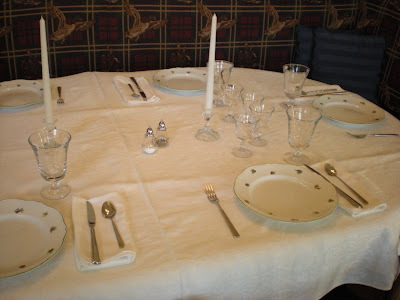 The crystal is Fostoria's Century pattern which was my paternal grandmother's. 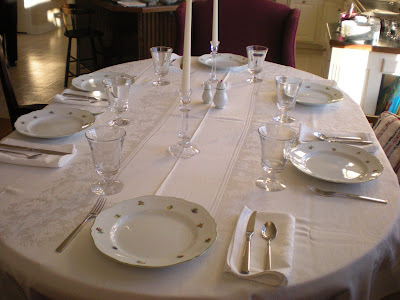 Here's another view of the tablescape. I love the clean lines of the white on white with the crystal and silver. 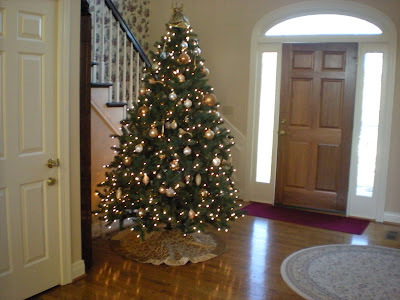 I took some shots of their Christmas tree while I was there. I love the gold and white theme tree. 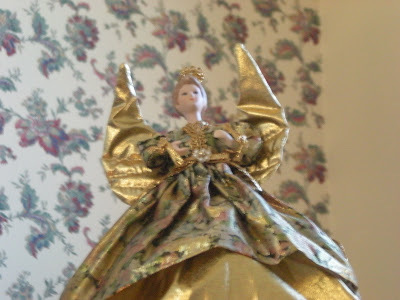 The angel that adorns the top. A long shot from their great room looking into the front entry way. Mom who cooked a delicious meal and we had a wonderful evening. 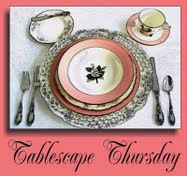 Now please join Susan over at Between Naps on the Porch for some more tablescapes.